Be ready to be mesmerized by the beauty of this wonder herb – Lavender! Think of the most beautiful and romantic scent – it is Lavender. Think of versatility and affordability, its lavender. Think of most delicately flavored and aromatic foods, it has lavender. Think of a herb, flower or medicine – all in one, it is lavender. One of the most versatile herbs in the entire materia medica of natural medicine is Lavender. Lavender not only used in manufacturing of cosmetics and perfumery, it is also used in European cuisine, extremely popular in French and English cuisine, where it is used to flavor tisanes, cold drinks, desserts and also as an essential component of Herbes-de-Provence, a blend of provencal herbs extensively used in Mediterranean cooking. It is also the most essential component in a natural medicine chest. Lavender is also widely cultivated for its essential oil, which happens to have one of the most mesmerizing and soothing scents of all. If one were to pick just one essential oil from the numerous choices available, the vote goes to Lavender. With as many as 1200 components and over 167 uses, and one of the most pleasing and soothing aromas, lavender is the most sought after of all essential oils. It is multipurpose, versatile, affordable and pleasant and comes with a host of health and beauty benefits. It is suitable for pregnant women, children and elderly, all skin types and all three doshas in Ayurveda. Lavender is edible and the essential oil is safe for ingestion in tiny doses. 1/4th of a drop in a glass of normal temperature water helps restore balance, calmness and even helps to bring down fever. Beware of the authenticity though. Essential oils are widely duplicated with fragrance oils or adulterated to lower the costs. An interesting and rare property of Lavender essential oil is that it can ease the sugar craving associated with low blood sugar. It’s soothing and calming anti inflammatory and anti bacterial properties make it extremely useful in suppositories to soothe inflamed vaginal or rectal tissues. In cosmetology lavender is used to counter effects of ageing in skin tissues, relaxation of nerves, healing and regeneration of skin cells. Lavender is a balancing herb and is effective in controlling excess sebum, and often seen as an essential ingredient in acne control formulae. It calms the inflammation and burning sensations while maintaining the sebum balance, heals the scars and helps in regenerating skin cells. Lavender is efficacious in hir formulations for oily scalp and hair fall for the same properties- sebum control, healing and rejuvenation. Lavender is tonic to the nervous system and one of the safest to use for all age groups. It’s calming and sedative properties make it extremely useful in insomnia, hypertension and anxiety. Try a combination of chamomile and lavender to relieve spasmodic cough, or on a restless night you will not be disappointed by the results. It is also reported to have anti-bacterial action against stubborn bacteria like E. Coli, Staphylococcus aurens, Diplococcus pneumoniae, Beta Henolytic strep and Klebsiella, which makes it a pleasant alternative to contemporary medicine, needless to say without harmful side-effects. The anti-fungal properties of lavender make it effective against Candida albicans and Athlete’s foot. It is a muscle relaxant therefore useful in High blood pressure, Tachycardia. Lavender is a surprisingly effective mosquito repellent too, and it also soothes insect bites and stings, and you can safely use it without dilution, its another rare property. A lesser known variety of Lavender, Spike Lavender (Lavendula Latifolia) is said to be an Immuno-boost and heart tonic. It is stronger and camphorous than the sweet smelling Lavendula Angustifolia but no less pleasing and enticing. Authentic lavender essential oil is non-irritant, pleasing to the senses and considered effective in combating influenza virus commonly used as a frequent rub, in suppositories and via inhalation. It is not at all to be compared or confused with the common scent you smell in regular lavender scented cosmetics. 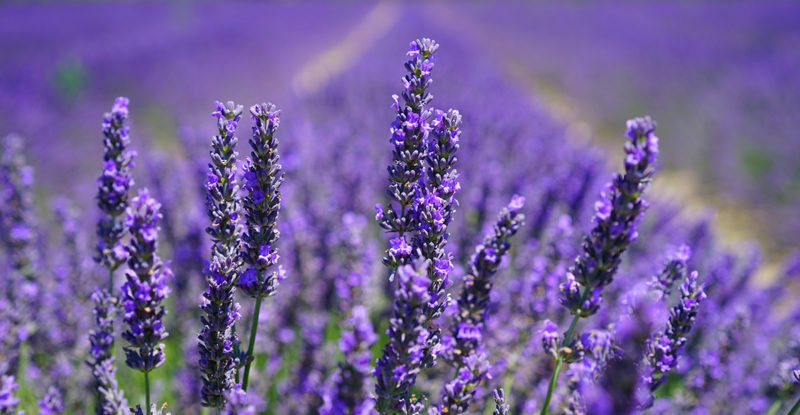 True lavender is extremely pleasing and enticing to the senses and most people, specially here in Indian subcontinent, who complained of not being fond of lavender scent were completely mesmerized and blown away after inhaling the scent of authentic lavender essential oil, to the extent of developing addiction to it. So if you’re one of those, you must try and find authentic lavender or you will miss the heavenly aromatic and therapeutic experience of one the most alluringly sensuously calming herb – Lavender!! Dosha Relevance: Neutralises Vata, Reduces Pitta and Kapha. Effects: Mildly cooling, Generally Balancing. Useful in: Burns, Itch, Skin conditions, Blisters, Sores, Insect bites, Sting, Wounds, Fever, Rheumatism, Depression, Anxiety, Insomnia, Cold, Flus, Bronchitis, Hypertension (high blood pressure), Acne, Mood swings, Fluid retention, Hormonal imbalance, Dandruff, Sebum control, Itchy scalp, Dermatitis, Boils, Yeast infections, Mosquito repellent, Sun-burn, Bug-bites, Motion sickness and many more..